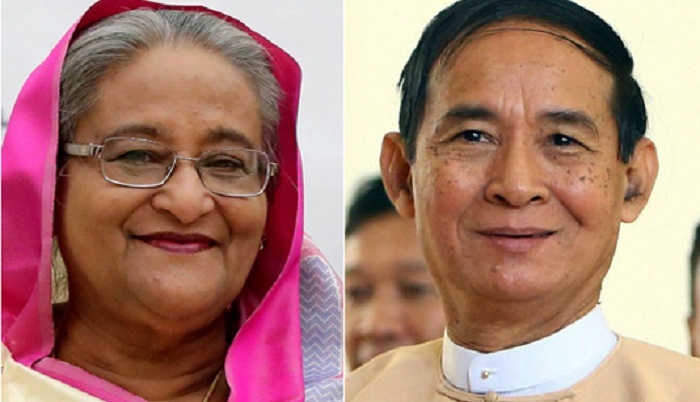 Myanmar President Win Myint has congratulated Prime Minister Sheikh Hasina and her party Bangladesh Awami League on the landslide victory in the 11th parliamentary polls. A congratulatory message from Myanmar president received in Dhaka on Tuesday. “May I extend my best wishes for the continued economic development, peace and prosperity of Bangladesh during your (Sheikh Hasina) third consecutive term in premiership,” Win Myint said. “Notwithstanding the challenges facing our two countries, I believe that, through our joint efforts based-on genuine goodwill and good neighbourliness, the bonds of friendship and cooperation between Myanmar and Bangladesh can be nurtured and strengthened,” he said. The Myanmar president said he looks forward to working more closely with Prime Minister Sheikh Hasina in addressing common challenges to the mutual benefit of the two countries.